A very weak low has formed off the Orissa coast, weak because of irregular formation, even though it is at 996 mb. A trough runs from the low along the East coast of India upto Chennai. This has brought the SWM into the South Konkan belt, interior Karnataka and TN today (Sunday). See Monsoon advance map on Current Weather Page. As forecasted, the low has brought some rainfall along the AP coast, with Kakinada measuring 31 mms and Ramagundam in Telengana region recieving 57 mms. (24 hrs Upto 5.30pm). Rainfall will increase in AP coastal and Telengana regions for a day on Monday. Will provide the much needed relief from the heat. Expect the low to fizzle out and merge with the trough by Monday night. Rentachintala was the highest on Sunday at 45.2c. Nearby, Orissa still sizzles today with Bhubaneshwar soaring to 44.1c today (Sunday). As mentioned in Vagaries 2 days ago, Delhi was forecasted to soon touch the 40s again, and the capital again soared to 41.8c on Sunday. Neighbouring Agra saw 43.5c today. Across the border too, the Sindh/Balochistan desert region was expected to cross the 45c mark today (as shown in the map), with Sukkur and Sibbi touching 46c today. Mumbai received some showers on Sunday, with S'Cruz and Colaba measuring 10 mms till 8.30pm. (Vagaries forecast was 7-10 mms). Though vagaries measured 18 mms (at Mahalaxmi, South Mumbai, till 10 pm). (Mumbai day rainfall, recorded at Vagaries, is periodically updated during the day on "Mumbai Readings@ Vagaries Station" Page). Vagaries is in no hurry to announce the advance of the SWM into Mumbai. Merely SW winds and a days 10 mms rain is not enough to announce the Monsoon. Other parameters have to concur as explained in the "comments" section. City will recieve around 5-10 mms (modified from <5 mms put yesterday) of rain on Monday. Tuesday will see less rain as forecasted. Pune was warm partly cloudy with light passing rains in the afternoon. No change in Pune forecast for next 2 days. South Konkan stations will get around 5-7 cms of Monsoon rains on Monday. Very breezy since morning in the Andheri area. 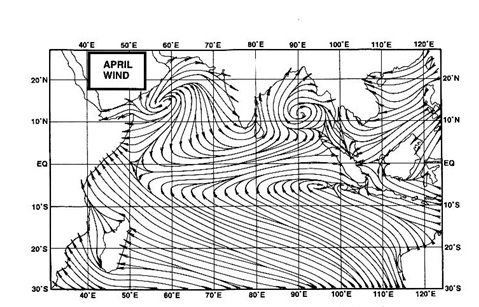 Charts show some kind of a swirl in the Arabian Sea off Mumbai, may be that's what's causing these windy conditions. The sky though is surprisingly quite clear and sunny with very few clouds, also it's not stuffy and uncomfortable as last week. Yes.. its windy in Mumbai. There is a low pressure area developed just off the coast of Mumbai. The winds are blowing from east into that low pressure area. low pressure in arabian sea? ?Are u sure? ?I think there is a trough & no low pressure in A.S..